When we lived in North Carolina, my friend Sara led us through a nature study lesson on conifers (cone-bearing trees). To be honest, I thought of them all as "pine trees." Before I moved to the South, I called them evergreens, too. They are evergreens, but so are magnolias! I knew there were different kinds, of course; there were blue spruce trees, for example, because we had them as Christmas trees sometimes when I was growing up. I knew the Michigan state tree was the Eastern white pine, and that the loblolly pine is the state tree of North Carolina. I hadn't put much thought into the differences between different kinds of conifers, though. Between studying with Sara, and researching on my own, I learned a lot! Because many of the conifers in North Carolina were the same ones I'd seen growing up in Michigan, I was familiar with them already and it wasn't too hard to determine their species. In Colorado, though, the trees are very different, and I'm still learning the specific kinds. As I was preparing for this post, I learned that there are TONS of kinds used in landscaping that aren't found in the wild, which means I won't necessarily be able to identify them with my tree books. Alas! If you haven't done a general study of trees before, you might want to look into that a little bit as you begin looking at conifers. The Handbook of Nature Study has a great lesson on trees. I also have posts on the Year Round Homeschooling blog, about starting a tree study and studying trees in the winter time. When we studied conifers specifically, we learned how to tell the difference between pine, spruce, and fir trees. Pine trees are pretty simple: if the needles come off the branches in groups of 2 (red pines), 3 (yellow pines) or 5 (white pines), it is a pine tree. Spruce and fir trees have single needles that come directly off their branches. Pine trees tend to lose their lower branches, where firs and spruces keep them (unless they are pruned). When you look at a pine cone, its scales are tough and woody. Needles are flat. If you pull one off and try to roll it between your fingers, it won't be easy to do. Fir needles grow directly onto the branch, so when they fall off, the branch is smooth. Needles are four-sided, and will roll easily between your fingers. Needles are attached to small, woody projections on their branches, so the branches are bumpy. 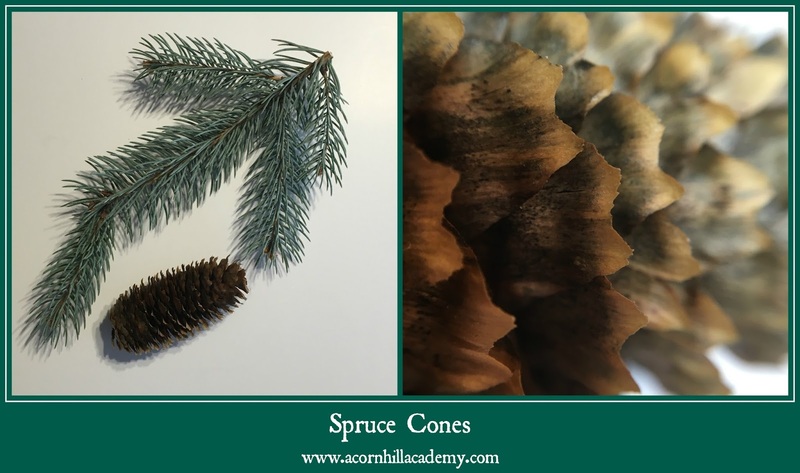 Spruce and fir cones have scales that are thin, almost papery. I am not sure what kinds of pine trees I have there, but I believe the fir is a White Fir, because of the fissures left in the branch from the pitch pockets. The spruce branch is from a Colorado Blue Spruce that grows in my yard. 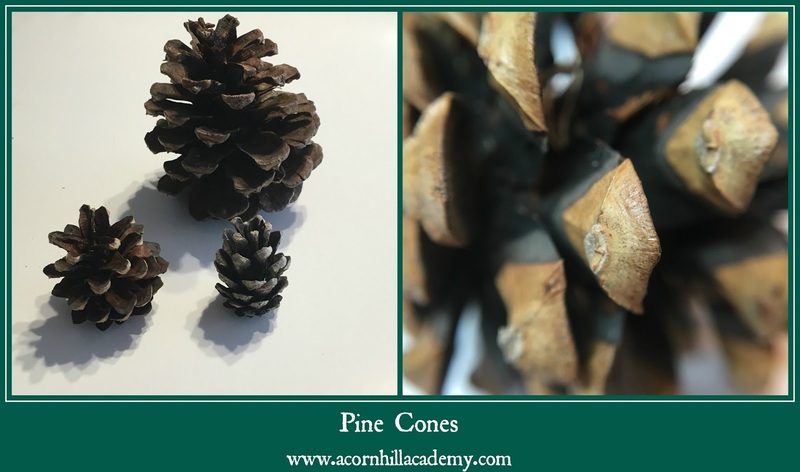 Look around and see what kinds of conifer trees you have nearby! Is there one you can study outside? If not, do you have a "real" Christmas tree in your house? If you do, it's probably a spruce or a fir tree. Can you tell which one it is? And, don't forget, you can easily make pine cone bird feeders to help out your feathered friends this winter! The Handbook of Nature Study, my very favorite resource for nature study, has sections on the pine (recommending studying a white pine if possible), the Norway spruce, and the hemlock tree. The two nature guides I have are Trees of Colorado and the Peterson Field Guide to Western Trees (here's a link to the Eastern version). Over at Year Round Homeschooling today, I have a post about Christmas trees - a little history, some science ideas, and some craft ideas. Head over there and check it out! And, as my gift to you, please enjoy this free Conifer Copywork ebook. Put some of the quotes in your nature journal if you like. Also, my friend Jennifer has a wonderful website called Advent Idea Box, with great information and resources for the Advent season.